Spring Break is coming to a close, and it’s been a great one for out-of-town visitors. Two weeks ago there was the Anime News Network party with lots of people here for Anime Japan. Last weekend two of my old friends from Montreal were in town for some sightseeing. We wandered around Harajuku, checking out Streamer Coffee and sampling their Military Latte. Sooooo, to show my love of Ponto and Shingo, I painted this little watercolor. I imagine they might take a grand voyage at some point to visit Shingo’s relatives–is that a little family resemblance with Mr. Eiga Dorobo? What do you think? Do you have a lot of traffic barrels where you live? Go check out Ponto and his pals and tell us what you think, or if there’s any other awesome webcomics we should be reading! This entry was posted in Uncategorized and tagged Art, Canada, Canadian, I painted this, illustration, Japan, Japanese, montreal, my art, paint, painting, ponto, quebec, shingo, watercolor, watercolour. Bookmark the permalink. 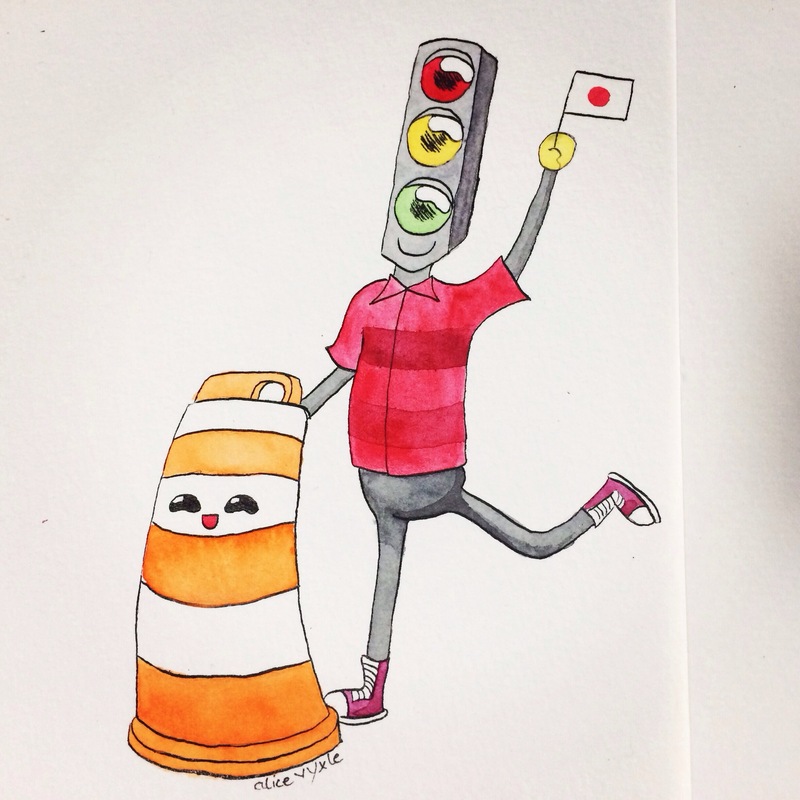 2 Responses to Today’s watercolor: Ponto and Shingo! That web comic is so cute! I love your interpretation.